Gross revenues grew by only 6% in the three months ended 30 September after adjusting for revenues of the divested ready-mix concrete business from year-ago results. The core E&C division grew revenues by less than 14%, lower than the 17.9% growth in the June quarter. 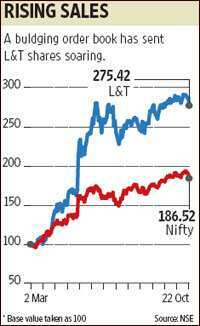 L&T’s shares, unsurprisingly, were among the top five losers in the Nifty of the National Stock Exchange. Still, the stock trades at in excess of Rs1,600 and is only around 7% lower than its 52-week high. Investor confidence is still high because of a strong trend in order inflows. In the E&C segment, fresh orders grew by 63% in the three months to September to Rs17,004 crore, compared with a 20% drop in the June quarter. There were some delays in signing orders in the June quarter, and the September quarter’s numbers would have benefited partly from a spillover effect. Total orders grew by 47.5% to Rs18,365 crore. This helped offset the drop in the June quarter; as a result, growth in orders in the first half of the year stands at 13.2%. The company expects orders to grow by 30% for the entire year, which translates into a growth expectation of 45% in the second half. This also means that orders would average Rs19,800 crore in the next two quarters, which is higher than orders booked in the September quarter. Similarly, although the revenue guidance has been pulled down, growth in the second half of the fiscal will be in excess of 20%, which compares well against the 4% growth recorded in the first six months. In any case, as long as orders are flowing in, investors are hopeful that they will translate into revenues. Especially so, since so far there are no signs thus far that the orders booked during the slowdown are low-quality in terms of margin profile and execution risk. Margins have been stable and the management hasn’t reported any order cancellations.